Innovative marketers from the U.S. and abroad converge on Las Vegas this week for the annual Pubcon marketing event. Minnesota-based Aimclear® joins an impressive roster of top industry presenters to focus specifically on psychographic audience targeting and mining deep value from Facebook marketing data. Aimclear Founder Marty Weintraub and Associate Creative Director Merry Morud are in Las Vegas this week to conduct multiple Pubcon sessions. Morud and Weintraub are wrapping up a busy Fall conference season, which included multiple international keynotes, sessions and workshops across three continents. Morud and Weintraub have shared their deep insights and knowledge with marketing audiences in Sydney, Munich, London, San Francisco, New York and now Las Vegas for Pubcon. The marketing power duo helped kick off Pubcon with a day-long Masters Group Workshop Training for marketers who opted to jumpstart their conference experience a day early on Monday, November 5. Aimclear has hosted dozens of similar workshops nationally and internationally. Aimclear’s Masters Group session featuring Morud and Weintraub drew a large crowd of early Pubcon attendees – those who wanted to invest extra time to maximize their overall Pubcon experience. Attendees learned deep, real-world tactics for precise, integrated social psychographic audience targeting. The hands-on techniques help marketers craft immediately actionable tactics to drive measurable ROI against marketing programs. Weintraub continues headlining and moderating multiple Pubcon sessions for the remainder of the week. Tuesday, November 6 features a Weintraub session “Mining Deep Facebook Data to Radically Profile Site Visitors & Email Lists,” during which Aimclear’s founder will dissect site visitor audiences across multiple channels. He will demonstrate groundbreaking data tapping tactics to help marketers operate at the forefront of digital marketing. Weintraub is also scheduled for real-time site reviews alongside other Pubcon presenters to provide attendees critical feedback on their websites and social channels. The feedback sessions are designed to help brands improve digital presence across channels while they deploy learnings from other Pubcon sessions. 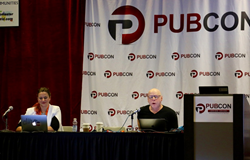 Pubcon 2017 wraps up Thursday, November 6. Aimclear® is a 6x Inc. 500/5000 digital marketing agency dominant in audience targeting and customer acquisition. Our differentiator is the Tao of holistic brand-builds and integrated psychographic performance marketing attribution. As Aimclear also distributes segmented messages to influencers for buzz, links and earned-media, the agency has evolved to be the missing link unifying search, social, PR, influencers and psychographic display. http://www.aimclear.com.